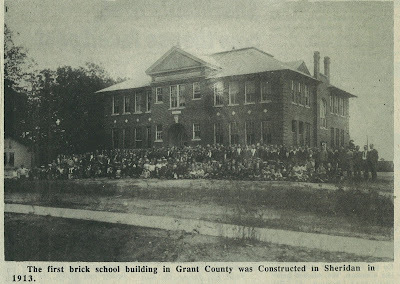 "The first brick school building in Grant County was constructed in Sheridan in 1913. A school was located just east of the present city of Sheridan in 1868. A short time later this school was probably relocated within the city limits. Speculation is that this building was located on Bell Street between Oak and Main. Classes for lower grades were being conducted there in 1879. One of the first teachers to be employed in the Sheridan School was Professor F. E. Winston, who was succeeded by Tom Ruffin. The Bell Street school remained at that location for a brief time and was soon relocated in 1882 at the site of the present Sheridan Middle School campus on Rock Street. This frame building was about twenty by thirty-six feet with a second story Masonic Hall and was administered by R. M. Rodgers. In 1886 he established a Normal School for the training of local teachers, locating it near the northwest corner of Oak and Pine streets in Sheridan. In 1893-94 the Board of Directors for the Sheridan School included Dr. J. B. Shaw, A. B. Childers, and P. E. Harper. The principal at that time was R. W. Anderson, with Frank W. Rushing as assistant principal. 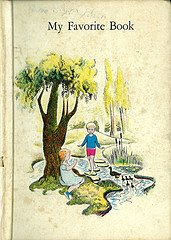 The curriculum in 1893-94 included higher arithmetic, algebra, geology, higher English, natural sciences, and Latin. 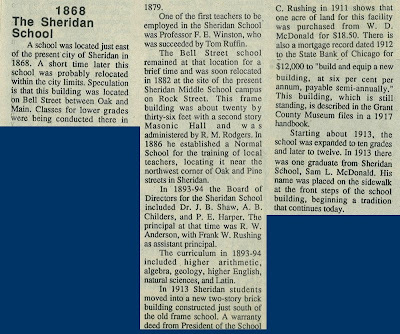 In 1913 Sheridan students moved into a new two-story brick building constructed just south of the old frame school. A warranty deed from President of the School Board J. L. Butler and Secretary T. C. Rushing in 1911 shows that one acre of land for this facility was purchased from W. D. McDonald for $18.50. There is also a mortgage record dated 1912 to the State Bank of Chicago for $12,000 to “build and equip a new building, at six percent per annum, payable semi-annually.” This building, which is still standing, is described in the Grant County Museum files in a 1917 handbook. 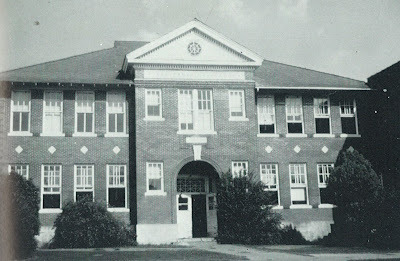 Starting about 1913, the school was expanded to ten grades and later to twelve. In 1913 there was one graduate from Sheridan School, Sam L. McDonald. His name was placed on the sidewalk at the front steps of the school building, beginning a tradition that continues today. The 1913 building, circa 1980's, before it's renovation into the current administration building.